Recirculating chiller systems are high efficiency, don’t use any CFCs, and since they are continuous duty, don’t waste water or refrigerant. Recirculating chillers are able to work in temperatures between -90 and 150 º C, below ambient temperature. They have many scientific and industrial applications within the manufacturing, laboratory, medical and military industries. Recirculating chillers provide cooling to remove mechanical or electrical heat produced in equipment or generated by an exothermic reaction. They also facilitate temperature testing of electronics in vacuum chambers, jacketed reaction vessels, heat exchangers, plastic molding and extrusion and plasma etching. In the medical industry, recirculating chillers cool lasers and medical imaging machines. The heat removal process is sped up by combining coolant circulation with high pressure flow. The chillers‘ power is measured in watts; the higher the power, the faster the heat removal rate. Like all chillers, recirculating chiller systems are composed of a compressor, condenser, thermostatic expansion valve and evaporator. A refrigerant gas is pumped into the compressor, where, under high pressure, it is converted from a saturated gas to a high temperature and pressure gas. It then travels to the compressor, where it is cooled and condensed into a liquid. This happens when ambient air or water takes the refrigerant’s heat. Next, it passes through the expansion valve, where the pressure and temperature drop below the point of the process fluid. Because of this, the heat transfers to the fluid, causing evaporation. The cycle then starts all over again when the gas travels back to the compressor. Recirculating chillers may have either water-cooled or air-cooled condensers, meaning there are different methods of transferring heat from the refrigerant gas to the water. 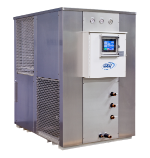 In humid locations, the chiller must be fully insulated to prevent lower cooling capacity. Factors like ambient air temperature, water temperature, process fluid, operation, maintenance, the desired chiller temperature and location altitude all effect the operation and effectiveness of a chiller. Recirculating Chillers Recirculating chillers are refrigerated liquid cooling systems that recycle the same refrigerant liquid within a closed loop. They provide precise, continuous duty temperature control by constantly recirculating a coolant through the temperature control unit, reservoir and refrigeration unit by a circulation pump, which is all housed in a casing. These units are compact, self-contained and usually portable due to caster mounts which allow easy transportation over hard, flat flooring.